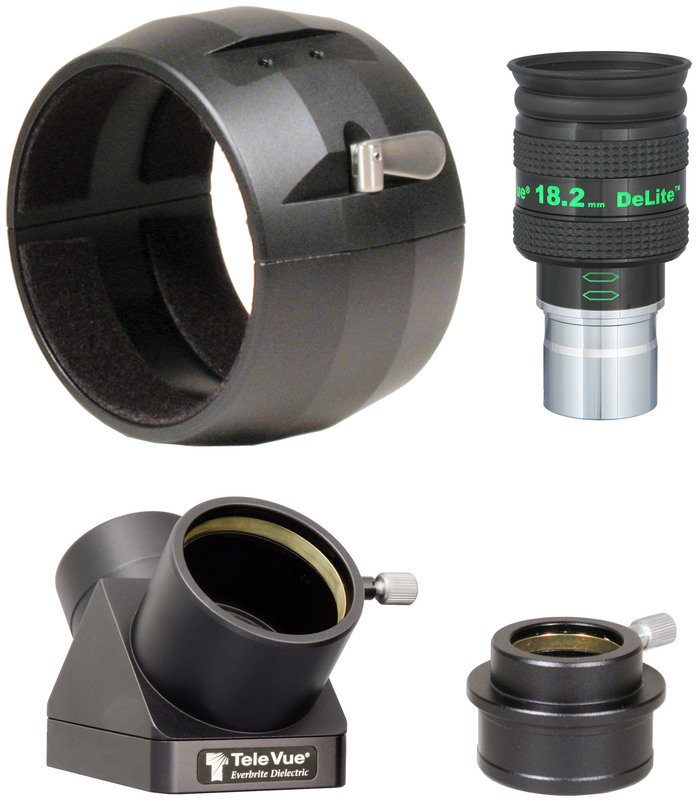 Al Nagler took Petzval’s portrait lens concept, using widely spaced doublets, and patented a fast telescope design version for the purpose of testing eyepieces. The 5”, f/4 MPT (Multi-Purpose Telescope) with its fast speed, wide, and flat field, led to a series of continuous improvements, primarily in color correction. By 2001, the NP101 (Nagler-Petzval) scope was the ultimate culmination of 30-years of refinement toward optical perfection for the “multi-purpose” concept. A review in the Backyard Astronomer’s Guide said: “optics don’t get any better than this.” But we did not rest on our laurels: with the CCD imaging revolution challenging telescope optics beyond anything ever placed at the focal plane, we were determined to make the NP series optically, mechanically, and functionally as perfect as possible for imaging on chips with up to 50-mm diagonal without penalty to its near ideal visual operation. 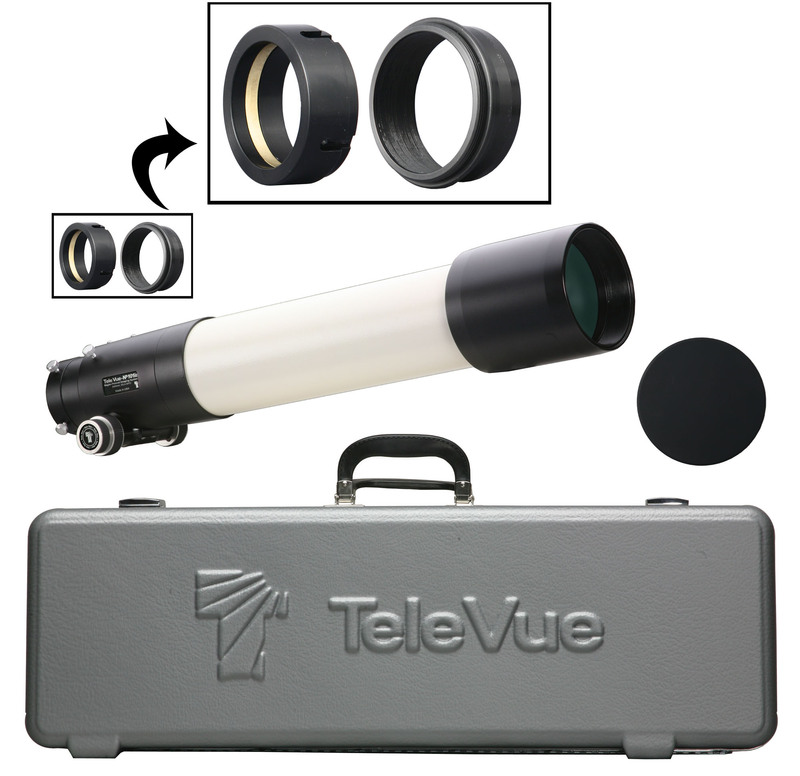 With Tele Vue Imaging System (“is”) telescopes, we have refined our instruments and optional equipment beyond anything a CCD chip has seen. 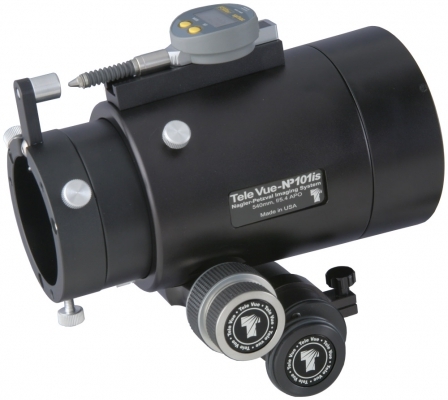 NPI-4057: TVNP101is scope with included accessories. This 101-mm objective diameter, 540-mm focal length, f/5.4, APO (4-elements in 2-groups, Nagler-Petzval) refractor has an OTA length of 25.5″ without diagonal. The maximum field-of-view is a huge 4.9° with 55-mm Plössl (10x) or 41-mm Panoptic (13x). NPI-5054: TVNP127is scope with included accessories. 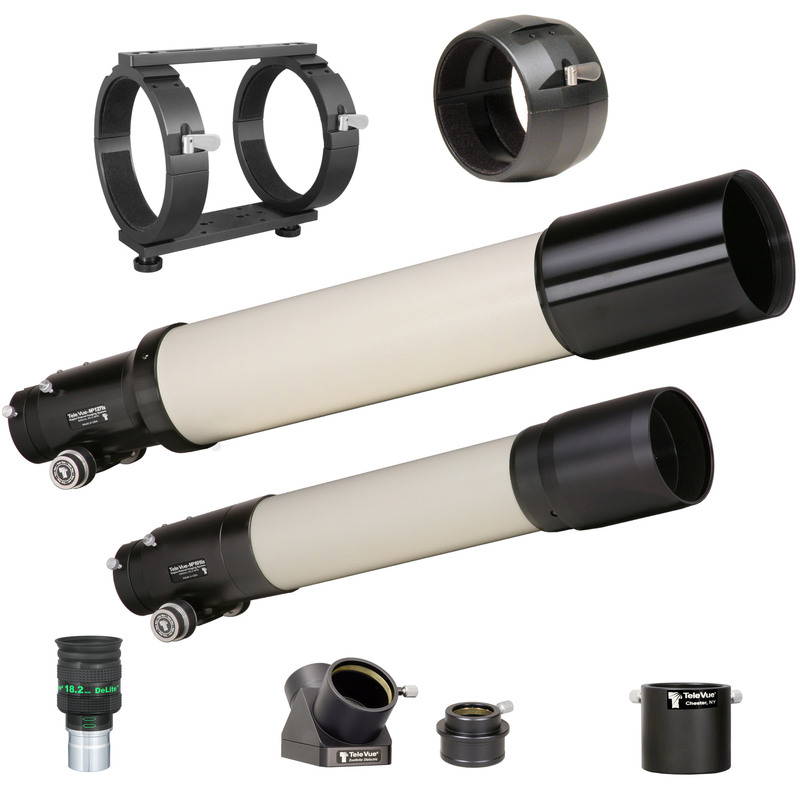 This 127-mm objective diameter, 660-mm focal length, f/5.2, APO (4-elements in 2-groups, Nagler-Petzval) refractor has an OTA length of 33.5″ without diagonal. The maximum field-of-view is a huge 4° with 55-mm Plössl (12x) or 41-mm Panoptic (16x). 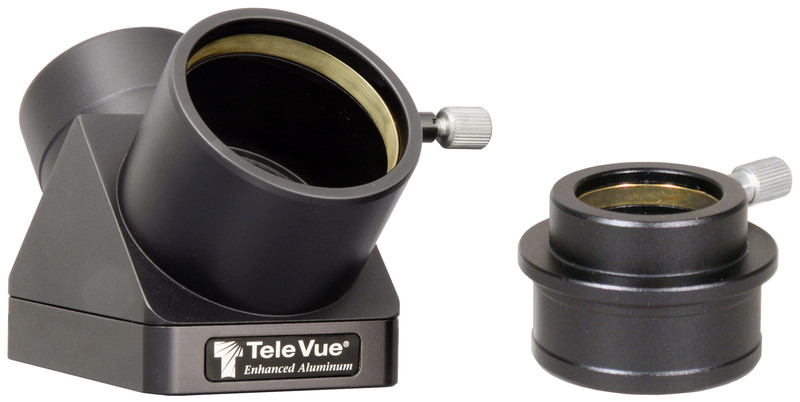 The objective end of the telescope draw tube has a 3″ opening that reduces to 2.4″ aperture for imaging on 50-mm chips without vignetting. 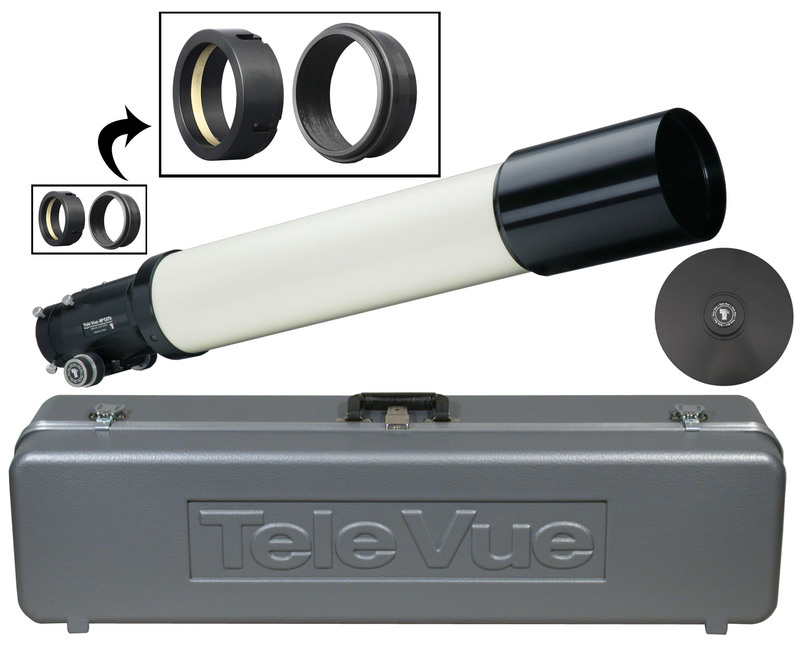 Included end ring inserts allow use of standard 2″ accessories or our 2.4″ Imaging System components. End ring features of Imaging System scopes. The standard Focusmate dual-speed 10:1 focuser allows for fine-focus and accepts the optional motorized FDF-2004 Focusmate Driver for vibration-free, variable-speed, electronic motor control down to 0.0005″ increments. This system can achieve repeatable focus positions to 0.0001″ accuracy with the optional 1 Micron Fine Indicator Kit. The focuser can handle 12-lbs / 5.4-kg of payload. Jam and jack screws on the end ring can be adjusted (and locked) to compensate for any tilt effects seen in CCD imaging. Two tension screws on the top of the focuser body can be adjusted to add resistance when using heavy equipment or lock the draw tube in place once focus has been achieved. These tension screws tighten against a brass clamp ring, which then cinches down on the Teflon sleeve in which the draw tube slides. Imaging System focuser with optional Digital Indicator Kit and Focusmate Driver. 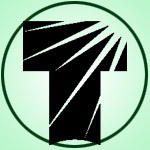 The OTAs comes with a sliding metal dew shield and screw-on metal lens cover. Each scope model has its own custom designed hard-shell carry case with room for all standard accessorizes. 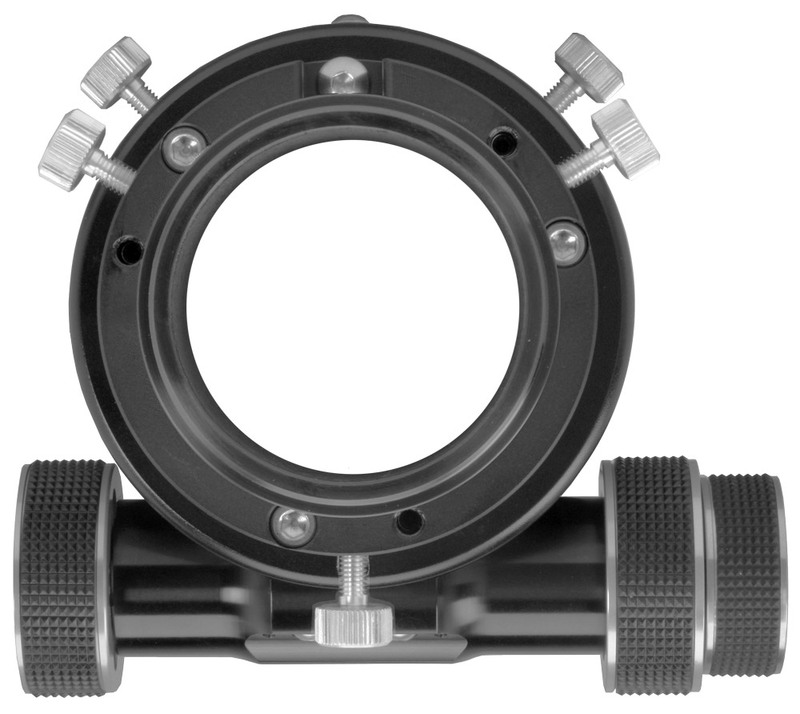 4″ clamshell-style Ring Mount with mounting threads to attach to a heavy-duty tripod or telescope mount. 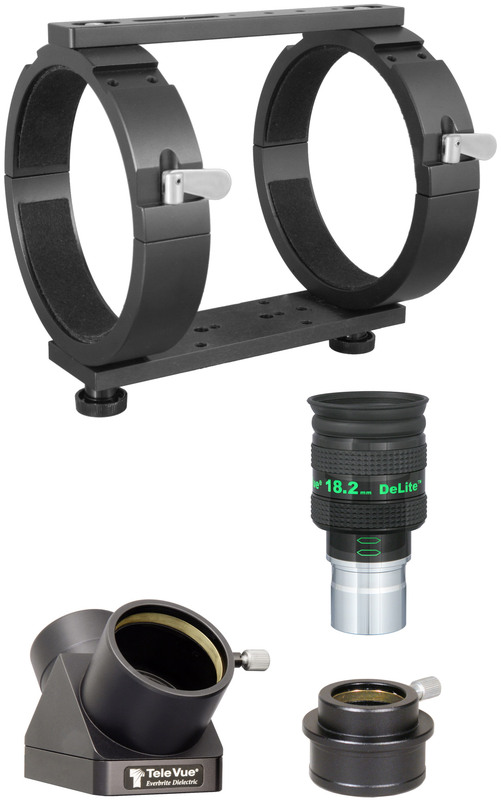 18.2-mm DeLite eyepiece, with 20-mm eye-relief, yields 2° true field of view at 30x in this scope. 5″ Ring Mount set with top and bottom plates. Top plate and rings take accessories. Bottom plate drilled to mate to a variety of mounts or mounting adapter plates. 18.2-mm DeLite eyepiece, with 20mm eye-relief, yields 1.7° true field of view at 36x in this scope. Our SCT Rich-Field Kit delivers up to a 3x increase in field area over 1.25″ diagonals. The package features our 2″ Everbrite diagonal and an adapter that screws onto the visual back to allow use of standard 2″ eyepiece accessories. Our diagonal bodies are machined from solid blocks of aluminum. This means heavy accessories can’t force the diagonal body to “unscrew” from the barrel as with other brands. Permanent alignment is CNC-machined into the diagonal. They feature brass clamp rings, anti-reflection threads, 48-mm filter threads, and now include our 2”-1¼” HiHat adapter with brass clamp ring. 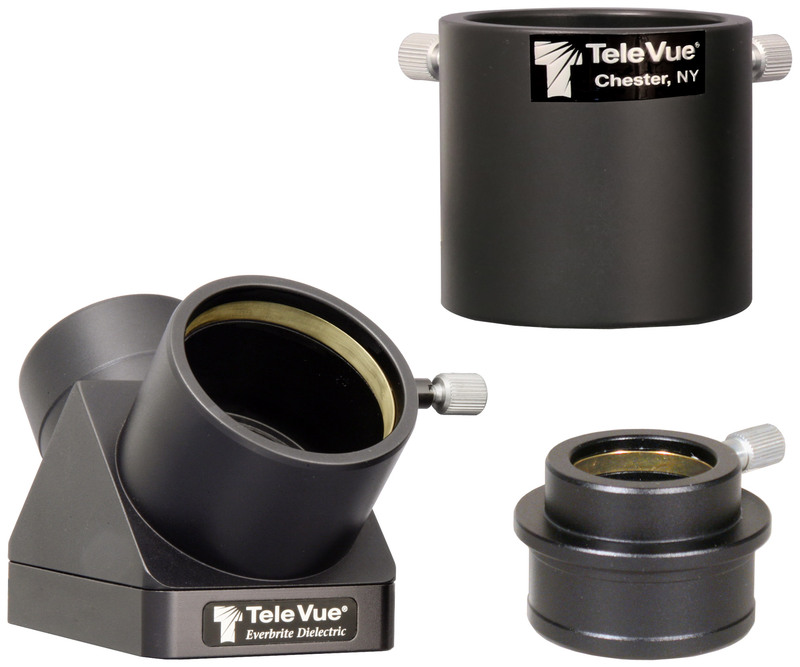 The “high-hat” adapter is specially designed with a high rise head to keep Tele Vue Barlows and Powermate™ amplifiers away from the diagonal mirror. We offer two mirrors with our diagonals: Everbrite and Enhanced Aluminum. Whiter and brighter images. Simply put, that is the benefit the Everbrite mirror coating. This exotic, dielectric, nonmetallic coating is 99% reflective across the full visual spectrum, resulting in the “whitest,” most natural image available. The sophisticated process of laying down more than 50 layers of coating is applied to a Pyrex substrate with 1/10 wave surface accuracy. Our Enhanced Aluminum mirror coating provides a 96% reflective surface across all but the extreme ends of the visual spectrum. The enhanced coating provides extra reflectance versus competing standard aluminum coatings. The final coating stage applies a tough overcoat to protect the aluminum. Next Next post: Tele Vue at 2018 NEAIC & NEAF this Week!